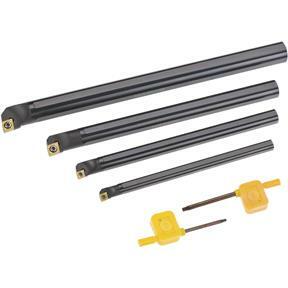 Carbide Insert CCMT Boring Bar Set, 4 pc. Grizzly T10439 - Carbide Insert CCMT Boring Bar Set, 4 pc. These right-hand indexable solid steel Boring Bars use 1/4" and 3/8", 80° diamond inserts and feature a negative 7° end and side cutting angle. Includes 3/8" x 6", 1/2" x 7", 5/8" x 8" and 3/4" x 10" boring bars. 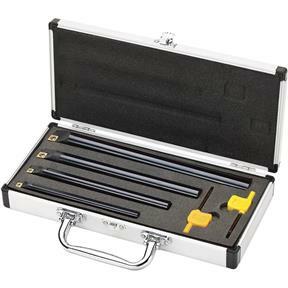 Set comes with Torx® wrenches and fitted aluminum case with handle. Uses CCMT21.51, CCGT21.51, CCMT060204, or CCGT060204 for small inserts; and CCMT32.51, CCGT32.51, CCMT09T304, or CCGT09T304 for large inserts.